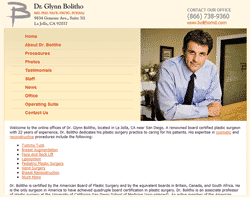 Dr. Bolitho needed content for his website that displayed his authority well, while also getting across his care and concern for his patients. In addition, he was ranking on the third page and below for his local niche health industry. We first provided Dr. Bolitho with in depth keyword research and key performance indicators (KPI) to ensure he was targeting the terms he needed to reach the broadest possible market. Once those terms were verified, we crafted the content according to his needs, as well as meta data to ensure click through from the search results. Today, Dr. Bolitho is ranking on the front page for many competitive niche terms in local search.